Read as bu-bur-cha-cha, sounds a music rhythm doesn't it? 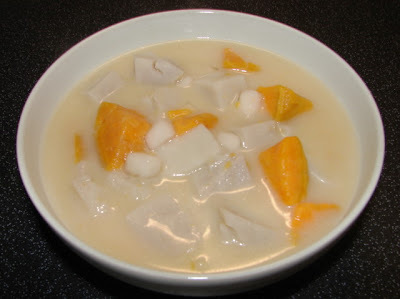 It's a Malay style sweet pudding soup with sweet potatoes, yam and chewy gummies, all flavoured with coconut milk, pandan leaf and sugar. Very easy pudding probably not a Westerner idea of pudding but if you are from Malaysia, Singapore, Brunei and Indonesia or had sampled this sweet soup before you probably will crave for it every now and again like I do. Bubur caca always comes with some gummy like chewies, some people love them and some don't. It's optional if you like them here is how. Some people add colouring to the gummies to make them look interesting, I never do that. Put the tapioca flour and sugar in a deep bowl, pour in the boiling water and mix with a spoon till it becomes lumpy and there are still flour not mixed in. Leave it to cool enough so you can knead it with your hand and the more you knead the more flour will be absorbed till you get the bowl clean and a stiff non sticky dough formed. Roll the dough into 5mm thick and cut into tiny little squares around 5-6mm wide. Boil the little squares in plenty of boiling water till they float and continue boiling for another 10 - 12 minutes or so. The longer you boil the more transparent they become and softer they become. I love them very chewy. Drain and leave them in a bowl of cold water till you are ready to add them to the bubur caca. Cut the sweet potatoes and yam into large chunks around 2 - 2.5cm. Tight the pandan leaves into a knot. Boil the water and pandan leaves till hot, then add in sweet potatoes and yam and bring it to a rolling boil, then turn the heat right down to simmer and continual boiling till the both sweet potatoes and yam are cooked and not falling apart too much. Remove pandan leaves add in coconut milk, chewy gummies, enough sugar and salt (optional) to taste, simmer a bit more till the soup is hot again. Ready to eat. Can be eaten hot or cold is lovely too.